Domaine, under jockey Vince Guerra, winning the Dastardly Desert Dash at Turf Paradise at Turf Paradise Sunday afternoon. 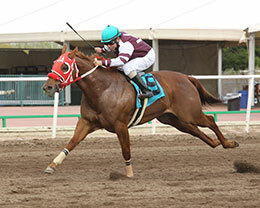 PHOENIX, AZ�JANUARY 22, 2017�Coming off a win in the AQRA Turf Paradise Derby consolation last month, Domaine (9-1) defeated Jess Ta Fied by a half-a-length in the $9,250 Dastardly Desert Dash (not black type) at Turf Paradise Sunday afternoon. Liberty Lajolla Sa finished a neck back in third. Saddled by trainer John Allred and ridden by jockey Vince Guerra, Domaine raced over the 300 yards in :15.431 seconds, a 97-speed index into a 9-mph crosswind. It was the fourth win in 11 career starts for the 4-year-old daughter of multiple stakes sire DOMINYUN. Racing for owner Scott McDaniel, Domaine earned $5,506 to boost her career total to $21,983. Bobby D. Cox bred the sorrel filly in Oklahoma from the Corona Cartel mare All In The Jeans. She was a finalist in the AQRA President's Fall Futurity and the AQRA President's Spring Derby. Jockey Julian Serrano guided Jess Ta Fied to his second-place effort for owner Cynthia Rodriguez and trainer Roy Ronquillo. Richard Joneson bred the sorrel gelding in Oklahoma. He earned $1,776 for the effort. Third place finisher Liberty Lajolla Sa races for owner/trainer Francisco Rodriguez. Gianni Franco Samaja bred the 5-year-old mare in California. Mark Jasso was up to earn $888. Domaine rewarded backers with $17.80 to win, $7.80 to place and $5.80 to show. Jess Ta Fied paid $4.80 and $3.60 and Liberty La Jolla returned $4.60 to show. De Moss, Bringin It On, Magical Righter, Stella Corona, Rgr Down N Dirty and Micato completed the field.